Over the years, UPSBC Ltd. has won such coveted awards as the International Asia Award in 1986, International Europe Award in 1987, the Most Outstanding Concrete Structure Award of the American Concrete Institute in 1995 and two awards of the Institution of Bridge Engineers in 1995. Apart from these awards for technical excellence, the Corporation is proud of having received the "Indira Gandhi Solidarity Award 1995"
Awards Conferred on UPSBC Ltd.
1.International Asia Award in 1986. 2.International Europe Award in 1987. 3. Longest 142.00m single span across river Ganga at Bhagalpur. 4. "Gold Award, for Excellence and business prestige" given in Quality Summit New York 2013. 5.Most Outstanding Concrete Structure award (Turbhey Flyover and Thane Creek Bridge, Mumbai) given by Indian Institute of Bridge Engineers. 6.Most Outstanding Concrete Structure award ITO Clover Leaves. New Delhi given by Indian Institute of Bridge Engineers. 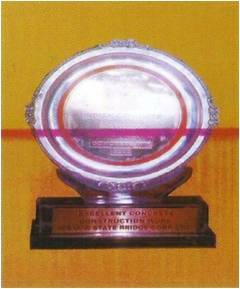 7.Most Outstanding Concrete Structure award (Mahanadi Bridge, Cuttack) given by Indian Institute of Bridge Engineers. 8.Super structure in PSC given by Indian institute of Bridge Engineer. 9.Info national Trophy for Quality 2014. 10.Excellent Concrete construction work given by Indian concrete Institute. 11.Mahanadi Bridge Project at Bhubneshwar, Orissa has been awarded for the best National Structure 2000 by IIBE. 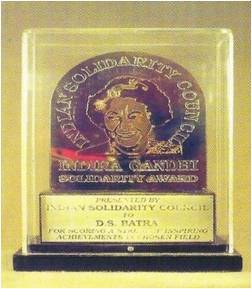 12.Indira Gandhi solidarity Award in 1995. 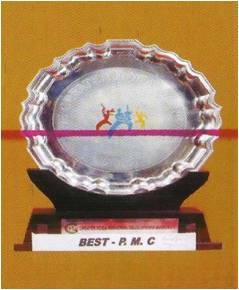 14.Best PMC at Greater Noida Carnival.